Take advantage of a unique Stereo3D visualization solution for design collaboration and presentation. Used in conjunction with a compatible stereo-ready 3 tube CRT or the new stereo-ready DLP projectors, StereoGraphics' Projection ZScreen projects bright, crisp, high-resolution color images from stereo-ready NT and UNIX workstations. Projection ZScreen is ideal for situations where concepts, facts, and results must be communicated clearly, precisely, and with impact to large audiences. StereoGraphics' Projection ZScreen is mounted over the projector lens and, when used in conjunction with polarized eyewear, creates an unparalleled sense of immersion. This combination is ideal for presenting Stereo3D imagery to large audiences and for use at trade shows. 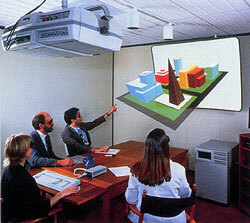 The Projection ZScreen comprises a Liquid Crystal modulating panel which is mounted over the projector lens, an electronic controller which drives the Projection ZScreen panel or CrystalEyes emitter, and all the connection cables to connect the system to your computer. Stereo3D is the use of computer technology to recreate the way we naturally see depth — stereoscopically. Stereoscopic viewing describes how we use both eyes — each with a slightly different perspective — to perceive depth in a physical environment. Stereo3D delivers the most realistic visual representation possible of complex digital models, giving engineers, architects and scientists the best possible understanding of three-dimensional information, and yielding levels of technical proficiency not available using a typical 3D view. Allows more accurate visualization of complex 3D images by large groups at a low cost. Allows earlier Stereo3D visualization of models, enhancing design review. With the projection ZScreen in place over the lens, high quality Stereo3D visualization is achieved using low-cost passive polarized eyewear. The electronics also acts as an emitter controller allowing emitters to be connected in a daisy chain fashion for powerful, crisp stereoscopic viewing with liquid-crystal shutter eyewear such as CrystalEyes. The new DMD projectors offer 1200x1028 resolution projection at 100+ Hz refresh rate. The new DLP projectors offer brightness up to 10,000 lumens allowing for stunning stereoscopic viewing in very large theaters. The projector simply plugs into the VGA connector on your computer. The Projection ZScreen works in conjunction with CRT projectors capable of supporting vertical refresh rates of 90 Hz or higher or with the NEW 3 Digital Micromirror Device (DMDTM) Digital Light Processing (DLPTM) projectors (such as Christie Digital Systems Mirage series). Projection ZScreens will NOT work with LCD projectors or DLP projectors with a single DMD. Dimensions: 8.3" x 7.9" x 2.6"